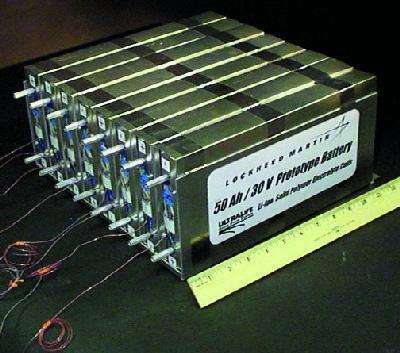 NASA Prototype Lithium-Ion Polymer Battery. Scientists today answered a question that worries millions of owners and potential owners of electric and hybrid vehicles using lithium-ion batteries: How long before the battery pack dies, leaving a sticker-shock bill for a fresh pack or a car ready for the junk heap? Their answer, presented here at the 245th National Meeting & Exposition of the American Chemical Society (ACS), may surprise skeptics. "The battery pack could be used during a quite reasonable period of time ranging from 5 to 20 years depending on many factors," said Mikael G. Cugnet, Ph.D., who spoke on the topic. "That's good news when you consider that some estimates put the average life expectancy of a new car at about eight years. Cugnet explained that the lifespan depends mainly on the battery's temperature, state of charge and charge protocol. Battery performance begins to suffer as soon as the temperature climbs above 86 degrees Fahrenheit. "The higher the temperature, the lower the battery service life," he said. "A temperature above 86 degrees F affects the battery pack performance instantly and even permanently if it lasts many months like in Middle East countries." Cugnet also recommended that electric vehicle (EV) owners pay attention to how much their battery is charged, another factor in a battery's longevity. He reported that a fully-charged battery is more vulnerable to losing power at temperatures above 86 degrees F.
To test the limits of lithium-ion EV batteries, Cugnet's team reconstructed the experience of a typical EV battery in the laboratory. Using data gleaned from a real five-mile trip in an EV, they put EV battery packs and cells through simulated lifetimes of driving with cycles of draining and recharging. The researchers considered a battery to be beyond its useful lifespan when it had lost 20 percent of its full power. The question of longevity matters to EV owners and manufacturers alike. The cost of the lithium-ion batteries that power these vehicles remains high, and an EV can cost twice as much as a gas or diesel equivalent. Customers want to make sure they get their money's worth, and manufacturers are eager to demonstrate that EVs are economical. One obvious saving is the cost of fuel over a car's lifetime, but EV makers are also pushing so-called "second life" uses for batteries that could make them valuable even after they've lost too much power to be useful in cars. These applications could include backup power for computers and medical equipment, or electrical grid storage, which would go hand-in-hand with renewable power like wind or solar to keep electricity flowing even when environmental conditions aren't right. Another option is recycling a battery's components to make new batteries. The market of Li-ion batteries is growing fast mainly due to the electric vehicle rebirth. However, the anticipated demand in electric vehicles is much lower than it was originally announced, since they can cost twice as much as similar gas-powered vehicles. Battery costs will unfortunately stay high until they can be made at high volumes. Among the various ways identified to decrease their price is the possibility of a battery second life in other applications, less demanding in power capability, such as utility storage. This means that batteries should not only be able to operate during the complete vehicle life, but also long after. Therefore, there is a need to investigate the way they degrade during rest (calendar life) and operation (cycle life) depending on the vehicle characteristics. This will help to improve the battery design, the battery management system, and consequently the electric vehicle competitiveness. The average age of a car or light truck in the US is 10.8 years at the moment. If a new car is expected to be scrapped at 8 years, the quality of the car cannot be very high, or alternatively there's some sort of government subsidy/tax that makes people destroy perfectly good cars. Five years is not "reasonable", is extremely poor. Driving a short range electric car, you can't even do that many miles per year so you'd barely reach 100k. They're going to be very expensive miles if that's all you get. Five years is not "reasonable", is extremely poor. Agree with you there, but five years was for people who live in places where the temperature is above 86 degrees the majority of the time. I live in the central U.S, and the low is rarely above 86, which means the battery would last probably in the 15 year range. Another option could be a battery cooler, similar to battery warmers that are currently used in colder climates. Cars are only supposed to last 8 years? Cars should easily last 10-20 years. That's 100k-200k miles if you do roughly 10k a year. Other than the battery, electric cars should last way longer since they have fewer moving parts. I think the real question is whether or not you are willing to buy an electric car now and simply hope that the price of replacing the battery has dropped to a reasonable level 10 years from now. I'd be perfectly fine with having to replace the battery even every couple of years if it was a reasonable price. but five years was for people who live in places where the temperature is above 86 degrees the majority of the time. Lithium batteries have the unfortunate habit of accumulating damage quickly when exposed to heat. If you did use them somewhere over 86 degrees continuously, the average lithium battery would be gone in a single year. 12 months of cumulative exposure to 30-40 celsius would reduce the battery capacity by about a quarter, which is more than what the article considers a dead battery. Discharging the battery half way and keeping it there helps though. And if it ever goes to 40 C or above, a couple weeks is enough to do significant damage.